Here you can download a preprocessed assembly of the OpenStreetMap data for the Antarctic land ice. 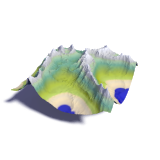 The land ice areas in Antarctica are not explicitly mapped in OpenStreetMap so you need to do some processing if you want to have polygon data representing the ice covered areas. This data set allows easy production of maps showing the ice and ice free areas like in my demonstration map. These packages contain shapefiles in web mercator (EPSG:3857) projection. They have been produced from the OpenStreetMap coastline data available on openstreetmapdata.com and other OSM data in the region using the icesheet_proc.sh script available on github. See this blog post for details. Split polygons and outlines are available separately. The outline files have an additional type attribute indicating if a segment of the outline is an ice-ocean boundary of another ice edge. These files are made available under the Open Database License and © OpenStreetMap contributors..
Current version is based on OSM data from September 27, 2014.